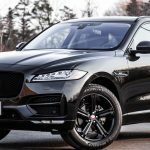 The Jaguar F-PACE model brings together innovation and versatility with the excitement of sports car-inspired agility. Offering a choice of advanced gasoline or diesel engines, there’s an F-PACE for every lifestyle. Powertrains include a standard 247-hp turbocharged 2.0-liter inline-four (also available with 296 hp), a 180-hp turbo-diesel 2.0-liter inline-four, and a 380-hp supercharged 3.0-liter V-6. A rigid aluminum structure instills driving confidence through sharp steering and superb body control. The interior is roomy and cargo space is ample; an 11-speaker audio system is standard.